Small builders have a tough time breaking into today’s modern carbon frame market. Bike creation requires engineering know-how, manufacturing expertise, and typically an interest in fabricating in Asia, where nearly all carbon frames are made. The next challenge is selling your newest creation in an increasingly competitive US market and doing battle with some really big, established brands. One such company that is proving itself as a small boutique bike builder is Eminent. In its second year of production, Eminent has just released its second model—a 29-inch-wheeled all-mountain machine dubbed the Onset. Lots of bikes roll through the halls at Vital, but very few elicit such a stop-you-in-your-tracks reaction as Eminent. The bikes just look unique. They feature radical design elements like angular tubing, a sloping top tube that aligns perfectly with the rear seat stays, a floating rear shock that bisects a forked seat tube, plus aggressive, square styling and gussets at every turn. The new Onset is one of the most different-looking suspension frames that we’ve seen in a while. The Onset also made us question if the bike had a ride that matched its aggressive looks or was it just an exercise in industrial design. To answer our question, we spent a day with Eminent’s owner, Jeff Soncrant, as he handed us his newest creation. Jeff honed his engineering knowledge in the automotive industry. But a love for riding bikes, and a stint at Easton-Bell Sports dialing in their product development cycle, got him thinking about how to build a better full-suspension frame and ultimately how to deliver it to your door. Here is the short version of how Eminent came to be. The conversation quickly turned to suspension, as Eminent uses a fairly unique design that they call AFS (Active Float System). As unique as AFS is, we couldn’t help but think, "‘doesn’t it look like an updated Lawwill design (Yeti DH-8 or Rotec RL9)?’"
But What About the Looks of the Frame? The Onset frame, like the Haste frame, is constructed of unidirectional carbon fiber throughout, fabricated using an EPS mandrel on the inside, covered in latex and mold release before being wrapped with carbon. The process creates a carbon tube that is very high quality, smooth inside and out. The floating rear dropouts, chainstays and linkage (seatstays) are made of the same carbon material. The pivots use IGUS bushings in low rotation pivot points (15-degrees or less) at the brake bracket and lower shock mount. You’ll find sealed Enduro brand angular contact bearings are used elsewhere to handle lateral forces. Titanium shock bolts save a bit of weight and tubed internal cable routing is used throughout for easy maintenance and no noise. The Onset frame is offered in sizes small, medium and large. Compared to the Haste, the new Onset has different head and seat tube angles, as well as a less rearward axle path. The reduction in rearward axle path was necessary to achieve the desired anti-squat and leverage ratio curve that Jeff wanted. The Onset suspension is also slightly smoother than the Haste, as it does away with some pivot washers that needed a break-in period on the Haste. Taking a closer look at the geometry specs, our size medium 140 Advanced model has a 66-degree head angle and a 75-degree seat angle. It sports a 23.66-inch top tube, a 17.01-inch reach and a 46.73-inch wheelbase. All the frame sizes have 17.4-inch chainstays and a 13.27-inch high bottom bracket. The numbers are pretty well centered in the mid-travel, 29er, all-mountain market right now, but they could be considered long, low and slack with a steep seat angle. Broadening the appeal of the Onset, Eminent is offering the bike in two different travels—140mm and 120mm. The only difference in the frame is the rear shock and the linkage. The ST builds see shorter travel 130mm forks, dual-piston brakes, narrower rims and tires, plus the head and seat angles are about a degree steeper. Good, better and best builds cover a broad range of budgets starting with 11-speed Shimano SLX, 11-speed Shimano XT and, hopefully, by the end of the year, the top-end 12-speed Shimano XTR. The bike that we’ve been riding is the middle 140 Advanced offering with 11-speed Shimano XT, DT Swiss M1700 wheels, FOX 36 150mm Elite Fit 4 fork and Float DPX2 rear shock. Other tasty bits include an MRP chainguide, KS LEV dropper post, Acros Blocklock headset, and Maxxis Minion DHF/DHR II 29 x 2.5-inch tires. Buying an Eminent bike is simple. The consumer-direct model that they introduced last year has been expanded upon and a dealer network has been added. You can still get an Onset delivered to your door, but if you prefer to check a bike out through a shop or at a demo, there are several to choose from and more on the way. Getting past the looks of the bike, our initial impression of the new Onset are that of balanced stability. Its long wheelbase and centered stance combined with the steep seat angle never makes the cockpit feel too stretched out. The bike is a little heavy compared to some others in this travel category. Ours weighs in a hair over 33 pounds after we converted the tires to tubeless. On the trail, however, the weight became less of a concern as the suspension, combined with 29-inch wheels, flowed over everything that came in our way. Our first ride with the Onset sent us 2,000 feet up a mountain and back down again on a backcountry adventure ride. The Onset's intended purpose is not to be a long-haul ascender, but wow, we were surprised by how well it climbs! Whether slogging up long fireroads or smashing up rocky steps, the Onset was sure-footed and capable. When the trail turned downward, things got even better. Stability was incredible regardless of how precariously exposed the trail happens to be—the best word that describes the ride is "planted." We clipped some rocks with our pedals here and there. Some might call the bottom bracket height a little low, but we’ve always been OK with sacrificing some pedal clearance for good cornering. The next ride tackled a wide range of rocky steeps, including drops and lots of technical features. The Onset is one of the most confident all-mountain bikes we’ve ever ridden descending steep, sketchy lines. It even took some getting used to, as a result. Trails that normally bounce and buck can be ridden faster than we expected and we had to learn to trust it. Manual into rocky steps, brake through a chunky turn, dive into off-camber lines—the Onset doesn’t flinch. Stiffness is exceptional. Although the Onset may weigh a little more, that extra weight feels like it’s being put to good use as this frame feels absolutely solid. Maxxis 2.5 DHR/F tires, 200/180mm rotors and XT four-piston calipers certainly let you push the extreme too; these key control points don’t hold anything back and let the frame do its thing. Looking at the rear AFS suspension, the rear triangle has the floating axle and the floating shock, making an almost perfect parallelogram. 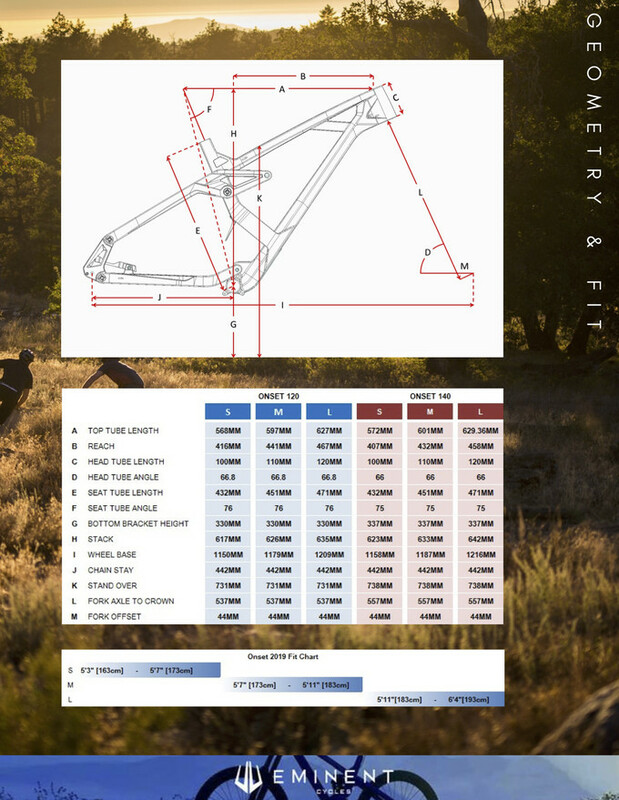 Jeff has worked his engineering magic, calculating the best anti-squat and compression ratio so that rear triangle is very isolated from the front and, more importantly, from the rider. It just sits back and does its job absorbing impacts and tracking straight. If the Onset has a weakness, we’d say it was on the flatter sections of trail. Standing and pedaling over flat terrain with jumps or rocks did not yield a poppy, playful ride for bike flicking. The bike’s weight, size and planted feel takes more effort to jump around. This bike was designed to go fast and maintain traction and contact with the trail. The Onset shines in the mountains, on enduro courses, in bike parks or on your local gravity trail. Its traction characteristics are so good, it’s a shame to ride it somewhere that doesn’t push that envelope. The Eminent Onset looks radical; it’s not for the squeamish that’s for sure. But looks can be deceiving, so we have been really impressed to find that the ride does, in fact, measure up to the appearance. The steeper the trail gets, the more we enjoyed riding the Onset. It has a stable, planted feel that truly shines on rough trails—going up or down. Jeff Soncrant should be proud of his creation. We just hope enough riders take notice of his unique bikes and help Eminent grow in a market that gets more crowded and competitive every day. Dr. Henry Turner will be live on Pinkbike today to respond to your questions.